Memories of the Cinema Museum: Boris Nelepo explains why Naum Kleiman and his team are so important for one of the world’s most significant cinema museums. These days the public interest has raised regarding the present and more importantly the future of Moscow Museum of Cinema which is one of the world’s cinematic landmarks and especially on the significant role that its previous director Naum Kleiman has played in recent history of Russian cinema. You can learn more about this obscure and strange situation in two open letters that support him and his team. Boris Nelepo, a film critic from Moscow, decides to focus on his personal experience and gives an excellent account of what the Museum and Naum’s team really signified for many thousands of Moscovites and visitors to the city. A hand reaches out to another hand. A shot from Godard’s Nouvelle Vague. Godard is inseparable in my memory from the place where I first saw this film. When Musei Kino was closed I had only begun to go there, I was sixteen. From that moment, every time I found myself in a new city the first thing I did was try to find the local cinemateque so as to experience once again those same emotions. 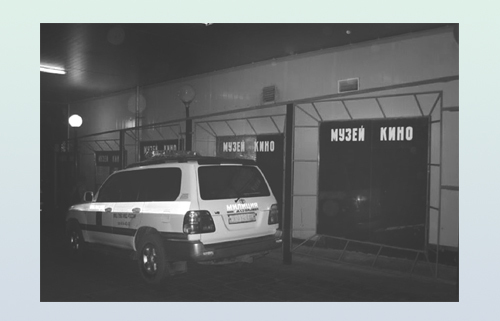 In many cities there is not any cinemateque but Moscow is the only place in the world where an authentic Cinema Museum worked for many years and then was liquidated. Naum Kleiman belongs to a special type of person, one can count them on the fingers of one’s hand. Henri Langlois, Jonas Mekas, Joao Benard da Costa. Without them there would have been no cinematography. This is no exaggeration: when Henri Langlois founded the Cinemateque Francaise, few people understood that cinematography was an art form and that it requires preserving. Even at that time an immense number of films had been lost which we can only now know from people’s memories or from archival annotations. Ghost films. Our Museum of Cinema was one of the best in the world. Again I am not exaggerating: the programmes which Naum Kleiman designed in the 1990s are today difficult to imagine even in New York or Paris. Kleiman and Maxim Pavlov (without whose professionalism and erudition a Cinema Museum would be impossible) even after what seemed to be its destruction demonstrated to us an unique lesson in their irreconcialability to this fact. In those nine years in which the Museum has been deprived of its own home it has undertaken more retrospectives than any national institution and these are always the most interesting, unexpected and thrilling programmes. They haven’t given up. And, alas, all of us without exception are guilty because we haven’t shown the solidarity, we haven’t shown any corresponding daring on our part. It has been precisely this experience of solidarity which could have finally been the trigger for that political will which is necessary to avert catastrophe. For in Russia in the noughties each and every year there appeared (and then quickly disappeared) ambitious cultural projects and festivals whose single budget of any of them would have been sufficient to preserve a sheltered life for the Cinema Museum. Precious time has been lost and this means that one must lose no more time. It is necessary to fight. Art of the present and of the future is impossible without that of the past. A Museum of Cinema is a take-off point for the existence of a national cinema. If there is no museum then not a single festival or movie theatre will have any meaning without it. Without a Cinema Museum Russia simply will no longer be on the cinematic map of the world. It will become a ghost country for film.